Heirloom is Ted Yost and Jason Burton. To give you an idea of where they are coming from, consider this: Ted’s introduction to gunsmithing was to learn how to work on (and make) British double shotguns. If what you want is the latest, cutting-edge tacticool-fashion 1911, do not come to Heirloom. If, however, you seek to have a pistol built that will be appreciated by even the most discerning (and traditional) 1911-ista, Heirloom is for you. Unconventional checkering patterns are not the vogue here. You will have your choice of lines per inch, and they will be done to perfection. Perfectly-polished slide flats, without rounded corners, dished areas or buffed-out markings, set off with frenched borders are the norm. Front sights are commonly done with a vertical gold line in the center, rather than obtrusive tritium cells inset into the blade. Now, if you want tritium, you can have them, but the preference at Heirloom is a gold line, or a gold bead in the front blade. The natural trend at Heirloom is to understatement, not flashy, of-the-moment cosmetic touches. Even when Heirloom does a “fighting gun” it will be understated, classic and flawless. Grips will be highly-figured, checkered or smooth for most guns, or aggressively-textured for a fighting gun, but in all instances fitted to perfection. A gun built by them is just that: an heirloom, something you will be proud to pass down to succeeding generations, for as long as that option is available to us. And it will, of course, perform flawlessly. There wouldn’t be any other point to it, would there? Now, Ted and Jason are not only full-house gun guys. If you have the need of some aspect of another build needing overhaul, or upgrade, they can do that. You can send them a gun built by a name ‘smith or maker, and ask them to change something, and they’d be happy to. Just be aware, as with so many custom gunsmiths, that they are doing things in the order they came in, and small one-detail jobs get done in-between the full-house guns. So, the schedule is the schedule. And while Heirloom prefers to work on Colt, they can and will build on a good base gun, such as a Springfield, Wilson Combat, Caspian, Les Baer, etc. Heirloom is one of the premier Browning Hi-Power places to go, just in case you want to expand your horizons beyond the 1911. 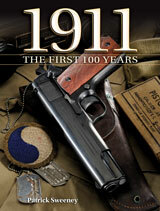 Click here to get your copy of 1911: The First 100 Years.